The Ghost Ark is a brand new piece of equipment created by Italian ghost hunters and enthusiasts in the paranormal field. The piece of equipment is an "all in one" tool that combines our Mel Meter (temp and EMF), EMF Meter (lights to detect changes in EMF field), Audio Recorder and Ghost Box all in one tool. This piece of equipment exports all of our data to a web application that analyzes and plots or data. The P-SB7 works by scanning the FM band and AM band along with a unique high frequency synthetic noise, a.k.a. white noise, where spirit voices seemingly are able to form words. The P-SB brand’s FM band scans 320 FM frequencies, which is further than any other competing brand known on the market, from 76 MHz to 108 MHz. Also, unique for the P-SB brand is that the band sweep speed can be selected – and from 7 different millisecond speeds. One can also sweep forward or backwards. A laser grid will produce an illuminated grid on a surface which can be used to detect shadow activity across a field. As a shadow passes by the light source it will break the illuminated grid allowing investigators to see movement. 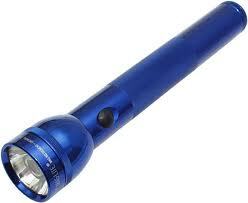 A flashlight can be used as a tool for communication allowing a spirit to manipulate the flashlight turning it on and off to answer questions that are asked of it. A motion sensor can be used as a visual aide to detect movement within an area by a spirit otherwise undetectable by the naked eye. A DVR system is used to record any visual source of evidence. "Hot spots" in a house or business are targeted with each camera to capture apparitions or movement of objects within the space. This evidence can be later played back. 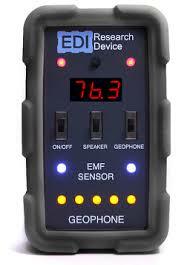 EDI meter is an all-in-one piece of ghost hunting equipment. It is composed of a EMF sensor, Ambient temperature monitor and Geophone. EMF Meter: The EDI utilizes a highly sensitive Electromagnetic Field Sensor programmed to detect changes in the electromagnetic field around the device. Lights near the sensor illuminate and change intensity to indicate fluctuations and strength of the energy change. 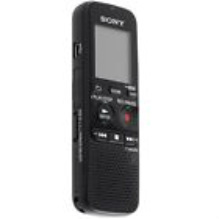 A speaker will also alert you to sharp change in EMF which can be switched on/off as you see fit. Ambient Thermometer: The EDI contains an ambient temperature sensor with a real-time digital display. Lights near the sensor illuminate to alert you to changes in temperature. If temperature changes sharply in a short period of time that might be indicative of something paranormal, the device will alert you with rapid blinking of the top red LEDs. Geophone Motion Sensing: The EDI contains a very sensitive geophone for detecting motion and vibration. A built-in accelerometer is programmed to pick up the slightest movements or vibrations on the surface it is sitting on. Even a small touch on the table the device sits on will set off the alert indicator - a panel of lights along the bottom of the unit. Like a graph, the device will light up the amount of LEDs based on the intensity of the vibration or movement. This can also be toggled on/off by a switch on the device if the device is being used in a hand-held fashion. The Paramid is a Stereo Ultra-Sonic Sensor. It not only will detect an object up to 4 feet away with an lcd display on the front, but it will tell you if the object is on the left or the right of the unit. The Electrascope is a Customized 2 channel Electroscope static meter. 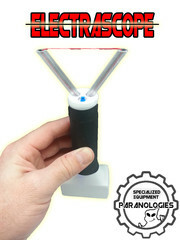 The Electrascope picks up TriboElectric Fields (static) and follows them Visually on the 2 Led Towers. It has been tailored for Paranormal Investigation's to detect Fields we cannot see with our eye's such as the hair lifting up from one's arm during an investigation. It is said that Spirit energy holds on to Static electricity and can be picked up from this meter. The Electrascope has one Red Led +Static and one Green -Static Led, and can be used for YES/NO questioning or place in doorways or the floor to pick up Energy fields that are Not produced by wiring in a house etc.. It be used as a handheld unit (hold the battery to ground yourself) to detect static fields. Or can be used like The Parascope to ask questions and get responses through static energy. 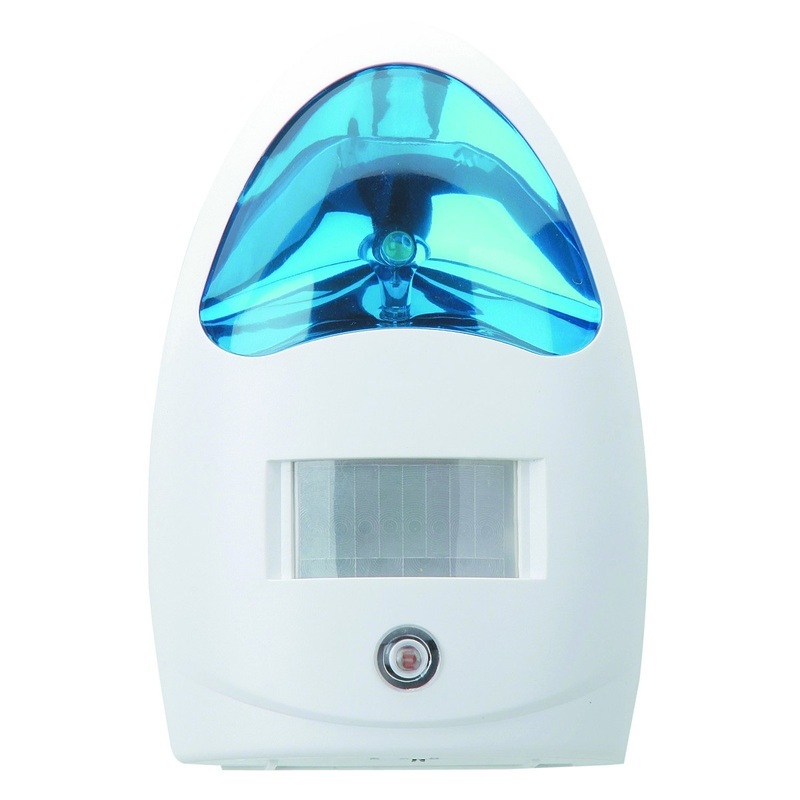 Ambient blue light to detect the unit in the dark. *The above list is meant to be informational and does not reflect exact images of equipment used or the inventory list in it's entirety. We are constantly adding new equipment to our inventory.